Neauvia is the first and the only Organic Dermal Filler line offering a natural look and minimizes the risk of adverse reactions. Neauvia Organic is manufactured using hyaluronic acid produced by a non-pathogenic strain of Bacillus subtilis, which is targeted at increasing the safety of treatments and allows to avoid reactive responses caused by protein residues. 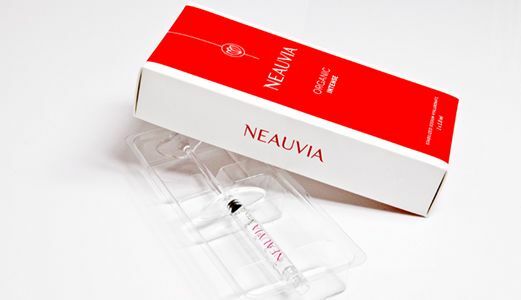 Neauvia is suitable for both woman and men of different ages. It can help with deep folds around the mouth and nose, sunken cheeks, facial scars, deep acne scars and loose skin. Neauvia Organic Dermal Filler Range has been developed for filling loss of tissue and to stimulate collagen production in the face & body. Smoothing fine, moderate and deep lines and wrinkles, including; Naso-labial folds, marionette lines, crows feet, tear trough. Hyaluronic acid (HA) is a naturally occurring polysaccharide that forms the structure of tissues and contributes to optimal functioning of many organs in the human body. HA is widely used in medicine and pharmacology due to its biocompatibility, biodegradability and various biological functions. Therefore, purity of hyaluronic acid is extremely important when it comes to safe human use. Acid obtained through Bacillus subtilis assures such purity. In a special purification process, which is conducted in water, hyaluronic acid produced by Bacillus subtilis is released directly to the medium. The use of the Bacillus subtilis bacteria in the production of hyaluronic acid allows obtaining a perfectly purified product that does not cause hypersensitive response and hence is absolutely safe for the human body. The Neauvia Organic dermal filler range also is unique as it the only dermal filler to be crosslinked with PEG. PEG is a well-known polymer on the pharmaceutical market, but was used for the first time in filler production by Neauvia. It is not only non-toxic, but also reduces the action of the proteolytic enzymes and immunogenicity of the substance to which it is added.